This video may be going on six months old now, but hey, freeballing and Dreamgirls is a combination that never goes out of style, right? That’s what we thought. 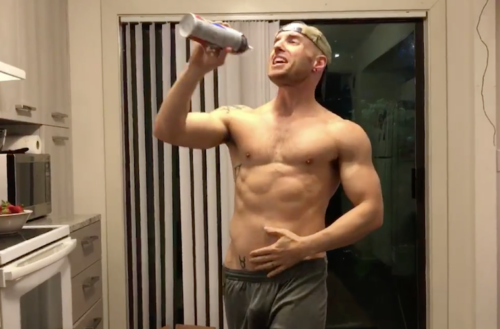 We just came across this a-little-bit-funny but a-whole-lot-hot video in which a guy named Griff Twombley-King (what a name, right?) was recorded by his hubby Rick performing an impromptu “routine” in the kitchen. And if you stick around to the very end of the performance, there is most definitely an “explosive happy ending” involving that can of whipped cream Griff has turned into a microphone. 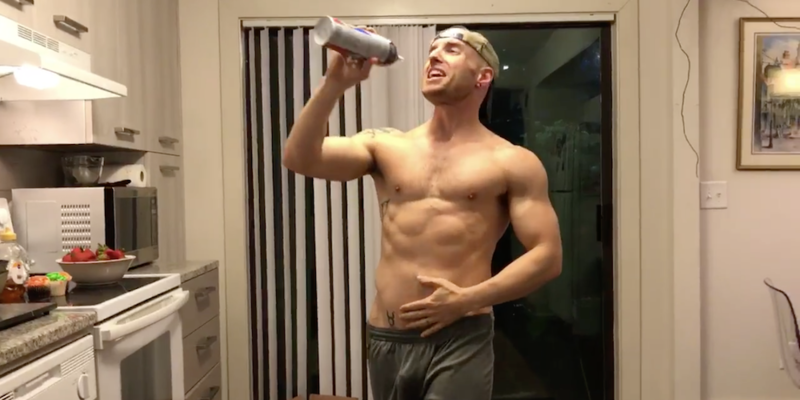 It looks like Griff doesn’t like wearing underwear (again, not complaining, per se) and is sporting a pair of grey basketball shorts, which are basically a gift to gay men handed down by the Lordt. Those shorts are, uh, quite revealing, Griff. Please always wear them. The only thing we don’t quite understand about what happens in the video, which you’ll see after you watch: Why the hell are you chucking what we presume to be perfectly good cupcakes?! Not cool, bruh. Not cool.